Today I have a special treat for you! One of my first writing buddies is a wonderful lady I met at the RT convention back in 2008. We were both aspiring back then and she has been such a font of encouragement for me throughout the whole journey. I’m absolutely delighted to let ya’ll know about her book series dedicated to the pirate world she loves. Please welcome Maureen O. Betita! She’s also generous enough to offer a prize to one lucky comment left on today’s post. Good luck! What is Your Impression Worth? I really believe in friendship, for the characters I write and for all those around me. And I’ve been blessed to find some awesome people in my life the last few years. The type of friends who listen to my woes and come up with solutions. Who send me delightful little things in the mail and those who post on my Facebook page, sharing photos and so many things that simply make me laugh. We all need to laugh more and FB is so good for that! As are friends. I recently worked on a 3 minute video, introducing myself, for a project I’m hoping to be part of… I know nothing about recording video. I knew my Dell had a camera thingy, but had no idea how to use it. Friends to the rescue! Bosun Janey knows who and what she is. A pirate. And a damned good one at that. Living a life of excitement, adventure, and sailing the seas of the Kraken’s Caribbean is enough for her. But when the Quill is stuck in dry dock, Janey is left to search for distraction along Tortuga’s waterfront. How does a pirate occupy herself? Certainly not by making friends with a six-year-old boy or mooning after the boy’s father. That’s not how a pirate behaves! Widower Benjamin Silvestri arrived in Tortuga seeking a fresh start. At first, the pirate haven doesn’t seem like a safe sanctuary for second chances, but life is full of surprises. The sun breathes life into his little boy, and new freedoms help his errant niece embrace her true nature. And then there’s Janey. A pirate and most unconventional woman, she stirs feelings in Benjamin that are far from proper. But who’s to say what is proper in Tortuga? Before he and Janey can explore the possibilities, Benjamin’s son and niece disappear onto the high seas. Together, the couple set out to rescue them—because only a loving father and a cut-throat pirate stand a chance against the dangers of The Pirate Circus. 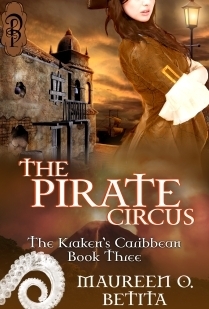 The Pirate Circus is the third book in my Kraken’s Caribbean series. A world where anything can happen, and usually does! Impressions, first or third…are they to be trusted? Not to mention preconceptions! Maureen O. Betita is an author living along the Monterey Coast. She has an interest in steampunk, pirates, scifi/fantasy, and, of course, kraken. You can find her and play with her, explore the Kraken’s Caribbean at her website, www.maureenobetita.com She’s also on FB at Maureen O. Betita Author, is on twitter as Maureen O. Betita and has a newsletter you can sign up for on her website. The Pirate Circus is available on February 3rd, from Decadent Publishing and other e-book outlets. One lucky comment today will win a copy of The Pirate Circus! Next Next post: WWWW: A Sign of the Times? Ooooh, great post and the book sounds great! Thanks so much! Ooo, pirates! *laughs* It sounds really good, and I like the idea of Janey being the pirate. I say this because I've never been introduced to these books. And since this is Book 3, I must go have a look into the first two. Who doesn't love a woman pirate? Awesomeness ahoy! Congrats on your new release. Kristin – Thanks so much for the enthusiasm! Missy – I never remember to say anything about that either! Sorcha – Ben really likes Janey…he's just not that sure he likes the pirate part of her! I loved the first two books in the Kraken series! I am counting down the days until this one comes out! Great writing Maureen and best of luck with The Pirate Circus! Ah, yer so sweet, Kim! Thanks for dropping by! No one knows piratey-goodness quite like you, Maureen 🙂 Congrats on the upcoming release and I can't wait to see you in April! Hey ho, Seleste! Yeah, RT will be here faster than lightning!